Captain Bayley’s Heir is the latest installment of G.A. Henty adventures from Heirloom Audio Productions. Just like the other audiobooks we have reviewed from Heirloom Audio, the productions are professional quality with unparalleled sound effects and voice quality. Put your earbuds in, close your eyes, and you’d think you’re at the movie theatre. In this rendition of Henty’s work, the story takes place both in the States and across the pond in England. The story follows the life of young Frank, an Englishman at a university, who is accused of a theft he didn’t commit. Because he believes that his family, which includes Captain Bayley, has taken the university’s side and believes him guilty, he flees to America in an attempt to clear his name. He leaves behind his family, friends, and his female interest – Alice. This is where the story splits. It goes back and forth between Frank in the States and Captain Bayley, Alice, and a young man named Henry in England. Henry is a young cripple who was (unbeknownst to him) adopted by a family near the Bayley estate. What does this have to do with the story? Well . . . the story is called Captain Bayley’s Heir (hint, hint). While in America, Frank works on a boat, makes several friends, one of which burps poetry, and eventually joins in the California Gold Rush. He encounters a few Injins along the way, and there lies the (famous) battle scenes in this installment. The traditional war scenes are traded for cowboy and Indian gun/bow and arrow fights. Our hero faces many trials, but through each one he is reminded by someone about God’s grace. Here’s an excerpt from Chapter 16 when Frank was talking to his friend and fellow gold digger, Abe. Abe was a constant source of godly encouragement for Frank, and we find out here why . . . he used to be a preacher. In the end, the reason Frank was framed is revealed, and I’ll tell you, I was surprised who the culprit was! Normally, we listen to audiobooks as a family either through the soundbar in the house or in the van while we travel to town. But this time I listened to it alone. Ever since I discovered the Live The Adventure Club, I read along with the script as I listen to the story. You can see an example of what that looks like above. I like to listen/read along alone before giving it to the kids to listen to. Not because I feel like I have to screen it, I just don’t hardly get to sit and listen when everyone else is around. You moms know what I’m talking about. I noticed in this story that the Gospel is more profound than the previous ones. I mean, the other stories all mention godly things, but this time, I don’t know, it just seemed to be a central theme. From the first chapter to the last, God’s grace and salvation are talked about. The Study Guide and Discussion Starter is 40 pages of discussion points, history-learning guides, and story-related Bible study that was designed by Christian educators. The study guide provides great ways to talk to your kids about the lessons learned in Captain Bayley’s Heir and how they can be incorporated into their day-to-day life. Each of the 20 chapters has his own one or two-page spread with questions, vocab, photos, and possible research ideas. See the example from Chapter 7 below. As you can see, some of the questions are pulled directly from the story and others involve more critical thinking. Captain Bayley’s Heir E-Book – G.A. Henty’s original Captain Bayley’s Heir E-Book with all new colorful graphics. This is a great companion to the audio adventure. Printable Cast Poster – A professionally designed, printable promotion poster (22” x 34”) featuring the cast of Captain Bayley’s Heir. 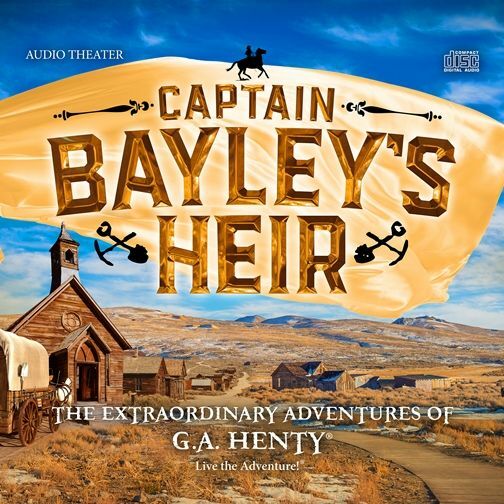 Captain Bayley’s Heir is a fantastic story that, like all the Heirloom Audio Productions, I highly recommend to families everywhere. Is Dragon Mommy Really Gone?